There are times in life, when you just need a piece of caramel slice. This is it! A truly delicious treat. It is not overly sweet as the coconut and oats help to balance it out. 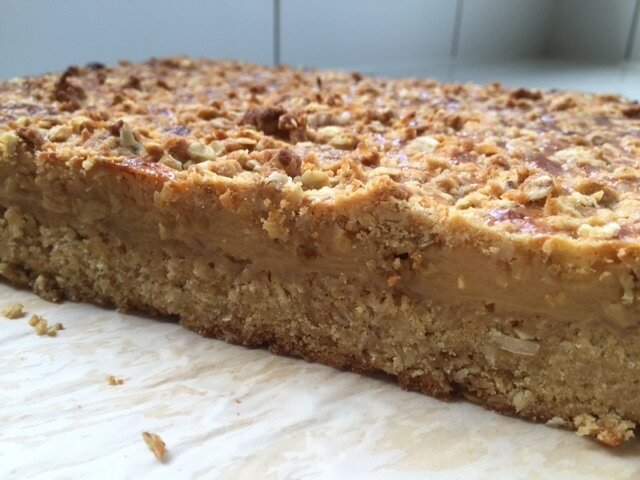 ​Main ingredients: Butter, flour, coconut, brown sugar, rolled oats, eggs, condensed milk, golden syrup. 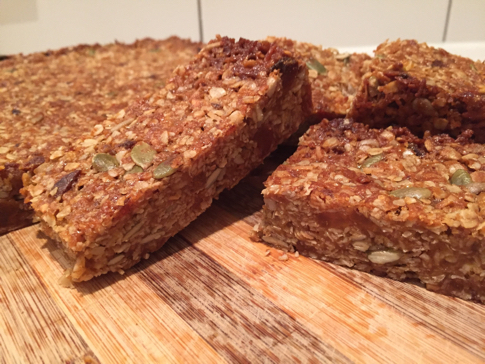 This has a deliciously chewy base filled with coconut and oats. It is a healthier take on the classic ginger crunch. Topped with a thin layer of ginger icing. Main ingredients: Butter, golden syrup, brown sugar, coconut, oats, flour, ginger, icing sugar. This is the ultimate Chocolate Brownie. It is rich and gooey with a crunchy top. This is able to be frozen and keeps incredibly well in the pantry…if it lasts that long. Main ingredients: Butter, cocoa, eggs, sugar, vanilla extract,chocolate chips, flour. This is filled with oats, seeds and apricots. It is great for lunch boxes, but make sure there is some for you to have with a cuppa. Pleas note, this slice contains ​Peanut Butter. A layer of dark chocolate can be added to the slice on request. Main ingredients: Rolled oats, dried apricots, pumpkin seeds, sunflower seeds, butter, golden syrup, brown sugar and peanut butter. This is a fabulous slice (everyone who has tired it, has raved about it!) that can be served on a special occasion but our families would be happy to eat it every day! 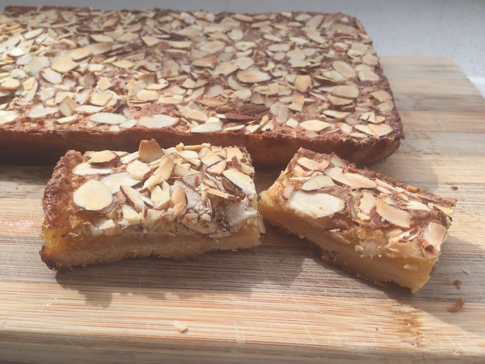 It has a crunchy base with a gooey citrus filling and flaked almonds on top. This keeps well in the pantry and can be frozen. 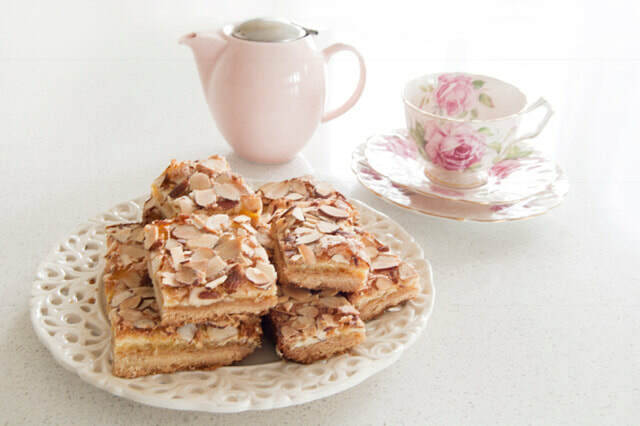 ​Main ingredients: Butter, flour, icing sugar, flaked almonds, eggs, lemon rind, orange juice, castor sugar. ​A crunchy chocolate and coconut base with chocolate icing on top. This is a treat but not as bad an you may think. It is such a crowd pleaser and keeps really well in the pantry or it can be cut and frozen. An absolute favourite. Main ingredients: Flour, sugar, coconut, cocoa, butter, chocolate chips and icing sugar. We acknowledge that this is expensive, but the main cost is in the mixed deluxe nuts and seeds. This is incredibly nutritious and packed with goodness. Angie always has this in her pantry and it is a great snack to keep you going. A small piece is so satisfying and you can have it with no guilt. It is able to be frozen but also keeps in the pantry for up to 2 weeks. 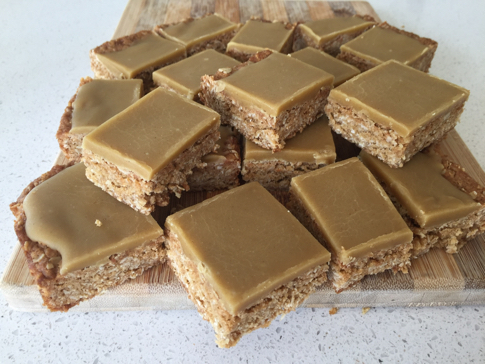 A very popular oat and coconut slice. It is crisp and chewy and is loved by young and old. 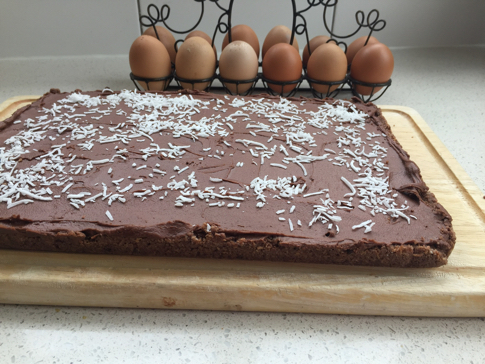 This amazingly simple slice is my sons all time favourite. ​Main ingredients: Butter, sugar, golden syrup, flour, rolled oats and coconut. This is a real hit with peanut lovers. This is not overly sweet but still satisfying. It is ideal for lunch boxes or with a cup of tea mid-morning. Please note that this slice contains peanuts. ​Main ingredients: Butter, sugar, golden syrup, flour, rice bubbles and peanuts. Crammed with raspberries and chunks of white chocolate. This slice is scrumptious served on it's own or it would make a splendid pudding served warm with ice cream or custard. 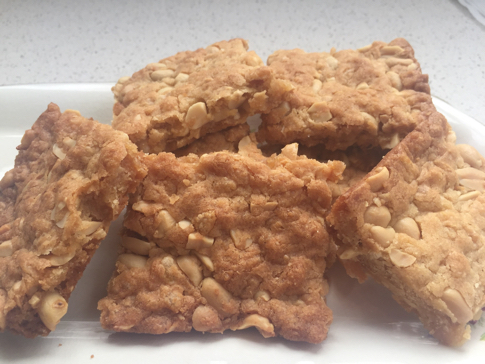 It has a mixture of flour, almond and coconut which gives it a nutty flavour. It is best on the day it is baked, and will soften over time. It really is special. Main ingredients:Gluten free/ flour, coconut, almond meal, butter, sugar, vanilla, egg, salt, baking powder, cinnamon, raspberries and white chocolate. This dark Chocolate brownie is packed with raspberries and chunks of white chocolate. It is truly decadent and would be ideal for a special occasion or a dessert. 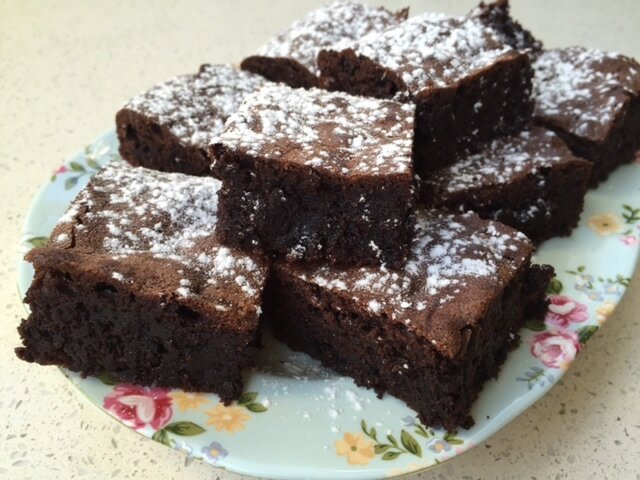 It has a crunchy top and edges, but the centre is exceptionally gooey and fudgy. It is best kept in the fridge for up to 5 days, although I doubt it would last that long! Main ingredients: Butter, dark chocolate, flour, sugar, vanilla, egg, salt, raspberries and white chocolate.